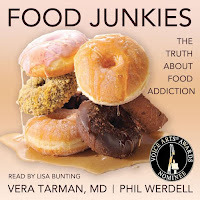 Goddess Fish Promotions has organized a Virtual Book Tour for the FOOD JUNKIES by Vera Tarman & Phil Werdell and read by Lisa Bunting, a non-fiction self-help audiobook available now from Post Hypnotic Press. You can check out the book trailer under the Video tab on the blog side bar (next to Popular Post tab). Be sure to follow the tour and comment; the more you comment, the better your chances of winning. The tour dates can be found by clicking here. For me, FOOD JUNKIES went in a direction I totally didn't expect. It places special emphasis on the addiction aspect of the disease. So often when experts talk about food addiction, we hear things about lack of willpower and doing things in moderation. Dr. Tasman frames food addition on the same wall with other widely accepted addictions such as alcoholism, gambling, and smoking. FOOD JUNKIES combines the science behind food addiction with real life stories about people struggling with the disease - in a way that is accessible and relatable. Unlike the "moderation" recommendations of many weight loss programs and gurus, Tasman and Werdell suggest that for some people, it might be best to eliminate certain trigger foods (like sugar and highly processed foods) from their diets. I was also surprised find there was so much information about food addiction and it's underlying role in other eating disorders (including misdiagnosis). I found the sections on the relationship between food addiction and anorexia particularly interesting - as I have known some people for whom traditional treatment methods had little effect. There is still so much to learn about the physical and psychological impacts of food addiction. Hopefully FOOD JUNKIES will shine a wider light on the issue, letting addicts know they are not alone and encouraging medical practitioners to widen their analysis of patients' problems. I can definitely understand why FOOD JUNKIES is finalist in the 2016 Voice Arts Awards. Lisa Bunting's narration is the right mixed of upbeat and soothing. She is able to deliver the science in an upbeat manner that holds your attention, while conveying the survivor stories with empathy and a soothing calmness. Whether you are someone struggling with food addiction or you are someone who believes food addiction isn't a real issue, you'll find something in this book to make you question the way you think about food. Food addiction is an issue for both men and women. For people of all sizes - from the extremely thin to the morbidly obese. If you are looking for help or answers, I haven't read a better book to start with than FOOD JUNKIES. I received a complementary copy of the book in exchange for an honest review - in conjunction with the blog tour. Vera and Phil are new authors to me and I'm looking forward to reading Food Junkies.